As part of conference at the recent MEBO Research Miami Beach Meetup in June, Nigel Manning, Principal Clinical Scientist in the department of Metabolic Biochemistry at Sheffield Children's Hospital (i.e. the UK TMAU tester), kindly provided MEBO with the latest statistics on their urine (phenotype) triemthylaminuria testing program. A bar graph and dot graph were kindly provided. 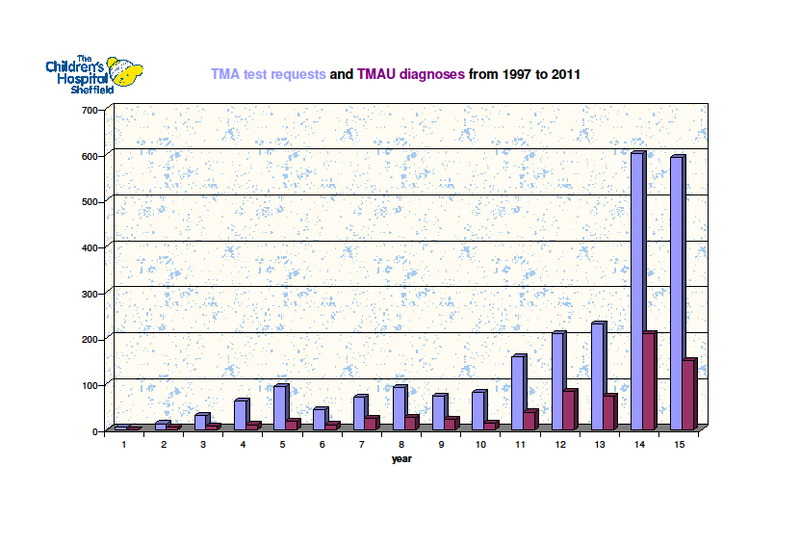 A trend of note was the bar graph shows that TMAU testing requests increased significantly since 2006, and especially over the last 2 years (to nearly 600 requests per year).